Nihonoodori (日本大通り) is an avenue located between Yokohama Stadium and Yokohama port. It was first western style avenue designed by Richard Brunton in 1870. It is popular for its Ginkgo avenue. 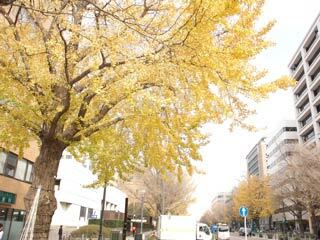 In the end of November, you can enjoy beautiful Autumn leaves of Ginkgo. It was used to be the main street of Yokohama.